BITPAL project launches an intensive training course in the fields of modern technologies and technology transfer mechanisms at Leipzig University of Applied Sciences. The course includes qualitative lectures and field visits to laboratories, centers of excellence and research offices in Leipzig. Dr. Ahmed Abdalaal, BITPAL Project Manager, talked about the importance of this visit as it helps the academics to keep pace with the modern techniques and provides the chance to connect the Palestinian universities with the German research institutions. 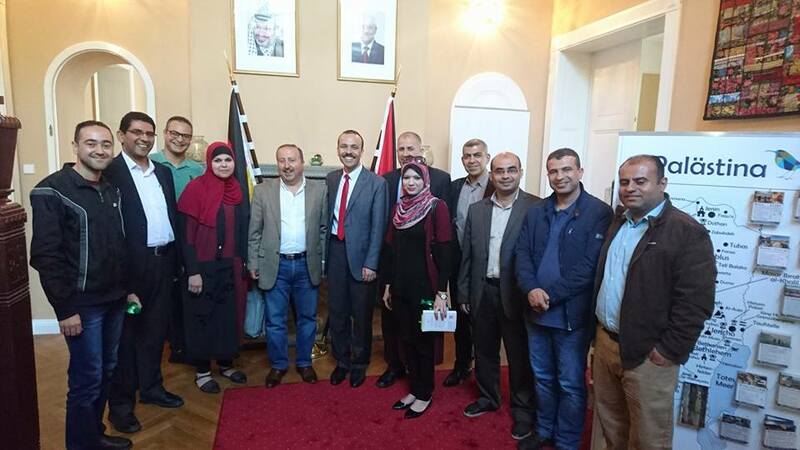 Dr. Kholoud Daibes, the Ambassador of Palestine in Germany, expressed her pleasure about the efforts of the Palestinian universities in running European projects and indicated the willingness of the embassy in providing all of the facilities to serve the Palestinian universities and the private companies. Representatives of UCAS, Al-Azhar University (AUG), Al-Aqsa University (AQU), Gaza University (GU) and Palestinian Information Technology Association of Companies (PITA) participated in the training course. It is worth mentioning that, UCAS is managing the BITPAL project within the framework of Erasmus+ program, which funded by the European Union and contains of 9 partners from Palestinian and European universities and private sector: UCAS, AUG, Islamic University (IUG), AQU, GU, PITA, University of Calabria (UNICAL), the FIS University and HWTK University.